It was certainly a winning weekend for the Alabama Crimson Tide. The football won team at Ole Miss while the volleyball squad earned a trio of wins at home in Tuscaloosa and the women’s golf team won the Mason Rudolph Women’s Championship. The men’s and women’s track and field team got the build going on Friday morning. “I had the opportunity to work with the future homeowner, painting the siding for her new home,” sophomore distance runner Sarah Mohan said. “She talked a lot about the whole community coming together and helping each other rebuild the houses on her street after the tornadoes came through. Friday afternoon saw the men’s and women’s tennis teams combine with the women’s basketball squad. “Just being able to give back, and knowing that you are being helpful and providing something for someone else is a big deal for me and definitely for our team,” senior women’s tennis player Joanna Savva said. 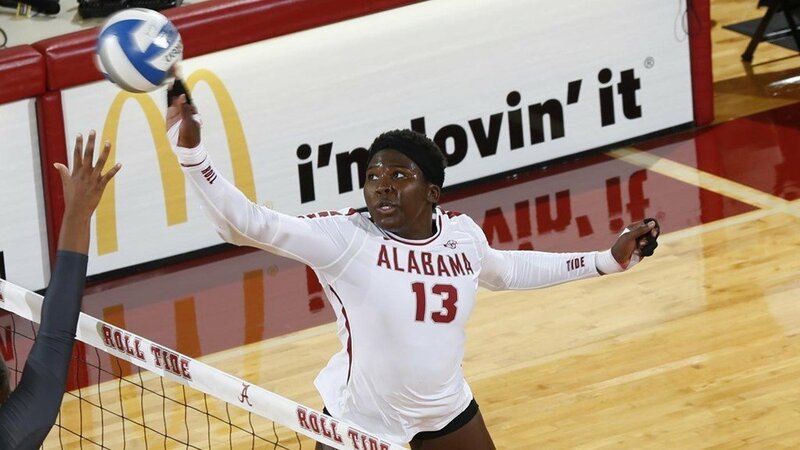 The sense of giving back is engrained in Alabama’s student-athletes. The teams worked over the course of two days at the build site that is just two miles from the athletics complex. “This community does a great job of coming out to support us, so it is nice to be able to give back in ways that we can,” women’s basketball junior forward Ashley Williams said. The Tide’s efforts in the community are nothing new, but they gained a heightened focus in the months and years that followed the devastating tornado that tore through Tuscaloosa in 2011. The gymnastics team got the second day of the work weekend underway bright and early. The Crimson Tide men’s and women’s swimming and diving teams traded their swim goggles for safety glasses and their kickboard for hammers following a grueling Saturday morning practice session. Like the other teams involved, being a part of the Habitat build reinvigorated the student-athletes. Courtesy of Alabama Athletics: for the latest news on Alabama Athletics, check out RollTide.com.